Our next Battle of the Books practice will be after school next Monday, December 3 until 3:45pm. Be sure to bring your books you are reading for competition. All are still welcome to join. Please see Miss Stout if you have any questions! Yearbook Picture Day: On December 4th we will have Yearbook Picture Day. We will be taking photos of clubs and organizations for inclusion in our yearbook. Ski Club: Hey Heritage! The HMS Ski Club wants you to join! Please see Ms. Boza or Mr. Gingerich for details on how to sign up! It’s a total blast and you’ll love it. The $100.00 Bus Fee is due December 19th…so please get that in as soon as possible. If you are interested in helping at the Holiday Music Performance on Monday night, December 3rd, please sign up outside Mrs. Reasinger’s room. Please remember our monthly meeting is Thursday, December 6th immediately after school in the Media Center. 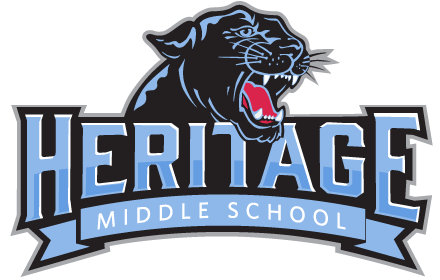 *The Heritage 8th Grade Boys Basketball Team beat Brookpark last night 45-17. The Panthers had a great overall team performance with 7 different players scoring. Nick Brown and Kyle Kesel had strong performances off the bench to lead the Panthers to a 2-0 start. *The Heritage Boys Flex team moved their record to 2-0 with a 36-22 victory over Memorial last night! Once again, the entire team was relentless on defense and efficient on offense. Collins Applegate and Vamsee Cheruvu led the team in scoring with 10 and 8 points each. The Panthers play again on Saturday against Worthington McCord! *Last night the 8th grade girls’ basketball defeated Brookpark Middle School by a score of 45-10. Ashley Cox led scoring with 13 points, and Ashley Powers contributed with 10 points as well.